Bud playing solo at Edenville, France, 1960s. Bud Powell's music has often been described as adapting Charlie Parker's bebop style to the piano. Other jazz authorities maintain that Bud was an originator, along with Parker and Gillespie, of the jazz style known as bebop. All agree that Bud is the father of modern jazz piano. Bud was trained in classical music as a child and his classical background plays a role in the harmonic sophistication of his music. 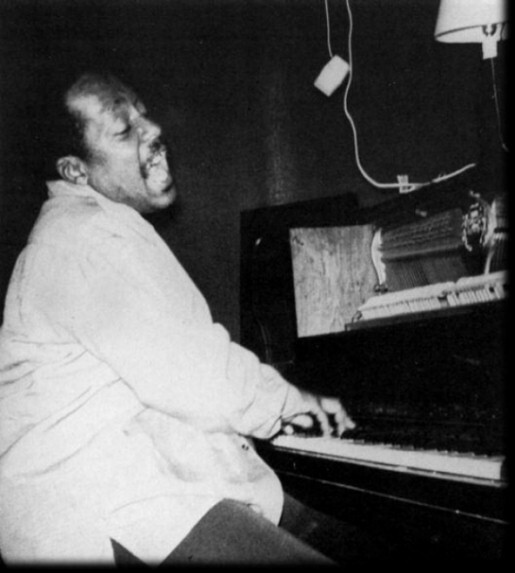 He was also intimately familiar with the early jazz piano style known as stride and one can recognize this element, sometimes quite explicitly, in Bud's playing. But the main characteristic of Bud's original piano style is a lightning fast right hand that expresses on the piano what up to Bud's time had only been possible on a horn. Bud was also a composer of approximately fifty tunes of great originality. Many of his greatest recordings are of his own compositions like "Tempus Fugit," "Bouncing with Bud," "Dance of the Infidels," "Hullucinations," "Celia," "Oblivion," and many others. "No one could play like Bud; too difficult, too quick, incredible!" "If I had to choose a single musician according to his artistic merit and the originality of his creation, but also for the greatness of his work, it would be Bud Powell. Nobody could measure up to him." "He was the foundation out of which stemmed the whole edifice of modern jazz piano. Every jazz pianist since Bud either came through him or is deliberately attempting to get away from playing like him." "Bud was the most brilliant that a spirit might be, a unique genius in our culture." "He laid down the basis of modern jazz piano." "Bud is a genuine genius." "In the early fifties I worked with Bud Powell at Birdland in New York City. We did not communicate verbally very much, but we listened intently to each other. . . . Bud knew how to reach the inspirational part of his mind; and when he was at his peak, his performances were absolute perfection in every respect. If this book helps to explain Bud Powell and his influence on generations of pianists who followed him, it will have done a great service toward the understanding of jazz and the illumination of an enigma, Bud Powell, a legendary figure in jazz history." "Bud Powell was an iconoclast, as unique in his own way as Thelonious Monk. A lot of my own style comes from what I learned playing with Bud . . . Bouncing with Bud explores all Bud Powell's recordings in a very readable way. I highly recommend it as a way for all jazz lovers to more fully appreciate the music of this incomparable artist." "I knew Bud from Birdland tour days and had the privilege of playing with him at the Blue Note in Paris in 1960. Although Charlie Parker was the man, Bud was the role model for a clearer understanding of chromaticism and harmonic possibilities in bebop as well as the impetus of forward motion - and incessant drive and exquisite lyricism. This book is a lover of this important artist. The book is great. I loved it. Bravo! Bravo! "